All eyes on you, Bats. This week, the 1000th issue of Detective Comics hit shelves, a celebration of the esteemed series’ most famous son (even if he didn’t show up till issue 27), just in time for his 80th birthday at the end of the week. But it is not this celebration of the Dark Knight that makes one particular tale timely. It’s an altogether different Bat-controversy. Regardless of whether you fall into line with Snyder’s view of the character or stand vehemently against it, one particularly pointed tale in Detective Comics #1000's anthology from DC Comics stands out as all the more intriguing, given the debate that’s ensued. 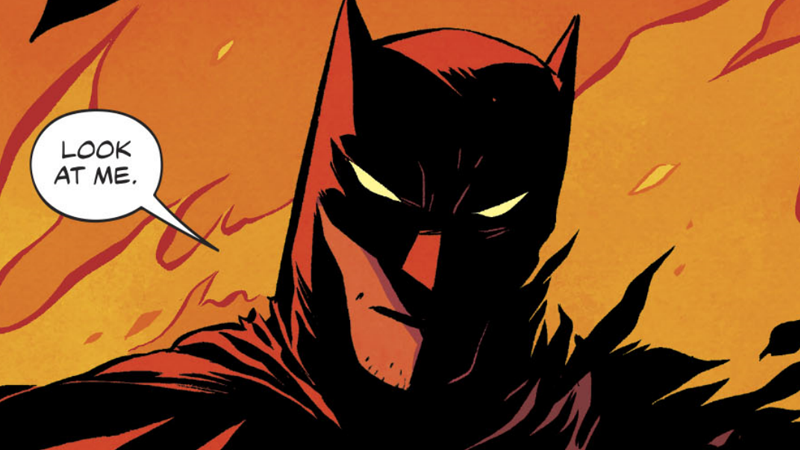 “The Batman’s Design”—written by Warren Ellis, with art by Becky Cloonan and Jordie Bellaire, and lettering by Simon Bowland—is a story that can only be told under the thesis that Batman doesn’t kill people. Set on one of a million nights in Gotham City, the story focuses on Batman chasing down a gang of power-suited and temporarily enhanced criminals he has meticulously researched, manipulated, and coerced through the shadows into a playground of his own choosing, so he can pick them off one-by-one. If you prefer your Dark Knight to be more serious, it might read as the ultimate celebration of “Batman with Prep Time,” the badass genius overthinker who is always five steps ahead of everyone else in the room, who always has the perfect plan up his Spandex sleeve. But it isn’t, really. It’s a celebration of one of the unspoken truths of Batman: that he’s basically Gotham City’s biggest drama queen, and he loves it. Bruce’s narration throughout the tale, brief as it is, notes the pleasure he feels in taking on foes that have enhancements, like temporary superpowers and power armor, because it’s an invitation to have some fun. He can set off meticulously laid explosive charges, spread out in a grid and triggered by voice command like he’s playing the most elaborately violent game of Battleship—or setting off pyrotechnics on a stage. And that’s literal, because it’s the code name he’s given his abandoned warehouse, inviting Alfred to note that Bruce should enjoy his performance. And enjoy it he does. As he keeps working his way through criminal after criminal—tailoring his takedowns to their records and tactical whims—he even cracks a few jokes. The ball-bearing-packed detonations will hurt, Bruce notes to himself, but the medical bills they cause will hurt more. Superstrength is useful, he muses elsewhere, as long as a body is capable of using it, as he flings a batarang into an assailant’s neck, precisely aimed to paralyze their arms. It’s brutally efficient, but at the same time, weirdly beautiful to watch unfold, the Batman—an artist—at work. Even once he’s cleared the field, except for the group’s unstable leader, Bruce’s flair for the dramatic is celebrated: emerging out of the flames caused by his own explosives, his commanding cry to the ringleader isn’t to stop what he’s doing or put down the detonator of the bomb strapped to his chest. It’s the cry of a performer: Look. At. Me. It’s said as a threat, and a warning of what could happen unless his foe relinquishes to him, but it’s also an invitation to behold the theatricality of Batman. Because if all the criminals look at his fancy costume and his lovely toys, they’re not looking at the people whose lives they could endanger. The act is fun for someone as cerebral as Bruce, but it’s also a distraction so he becomes the focus of Gotham’s villainous ire rather than anyone else. A lot of the stories in Detective Comics #1000 center around a similar theme, the inherent sadness that lingers and defines Batman’s 80-year history. “The Batman’s Design” is bleak, yes, because its ultimate thesis is that Batman’s theatricality is the sign of a man just as broken as the people he chases down every night. After all, his idea of a fun ride is still beating up a bunch of thugs. But, in its own way, it also embraces an almost cheeky sense of fun that is often unspoken about a man who chose to fight crime by dressing up in a bat-costume and building some gizmos. Batman doesn’t kill people, because where’s the fun in that? He’s a performer. He goes out of his way to be one. Because the performance, the drama of it all, even under the intent of striking terror in the hearts of his foes—that’s the fun and games to Bruce Wayne. It’s the only way he can chase away even a bit of the dark in his life. Embracing it and becoming a killer doesn’t just render his crusade against that darkness moot, it robs Bruce of the closest thing he has to fun in his wild, weird life.